Ministry Haven is a Christian conference and retreat center serving the needs of Christian families in various areas of ministry. We provide a quiet place for pastors and missionaries and their families to rest, rebuild family relationships, and renew their relationship with the Lord. We believe so strongly that the Lord commands those of us in ministry to take time away to rest and renew our relationship with Him, that we invite pastors and missionaries to come stay with us for free! 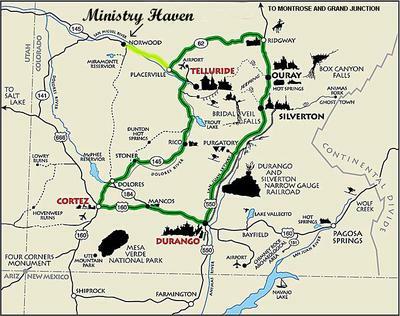 Located in the mountains of Southwest Colorado, Ministry Haven is a secluded, peaceful place to rest, relax and be renewed. Visit our website or call 888-327-2343 for more information. Ministry Haven in Norwood was such a blessing to us. We spent two weeks of our sabbatical there and used the accommodations for resting, relaxing, reading and reconnecting with God. The area is beautiful with many places to explore and enjoy God's creation. Ken and Chris are great hosts and it's always a joy to share with fellow believers in Jesus Christ.